Select Automatic Re-Ordering for Every 60 or 90 Days. 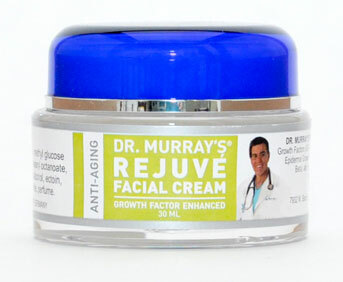 Sign up to AutoShip Rejuvé Facial Cream™ and Save 10%! Now you can have Rejuve shipped conveniently to your door every 60 or 120 days! Just select the schedule you'd like from the options above! Skin rejuvenation is the goal of many of our patients particularly in Florida. Rejuve Facial Cream™ is our answer. Unlike over the counter skin creams that promise to improve the condition of your skin, Rejuve Facial Cream™ delivers. My patients swear by it and the reason is because Rejuve Facial Cream™ actually helps skin damage and the natural aging process. It isn’t a fountain of youth but it is a cream of youth. The reason for the remarkable results you will see on your own skin is because Rejuve is enhanced with extra growth factors. It actually has all 9 growth factors in it to rejuvenate your skin. In fact, it contains 100% more growth factors than plain colostrum body cream and the “ectoin” in our ingredient helps with UV light damage to your skin. Use Rejuve Facial Cream™ and your skin will feel better and look better and if you have any doubts I guarantee it with my 100% money back, “no questions asked” guarantee. You will either get the results you want or get your money back. 29 points will be rewarded to you when you buy this item. Sign into your account to view or redeem your points. When you're signed in, you'll be able to redeem your points on eligible products!